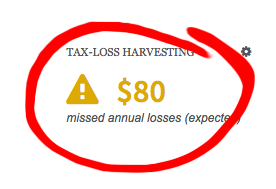 Excited to see that Betterment has upped its game by extending tax loss harvesting to all of their customers… including me. I wrote about this before when I explained why Betterment seems like the best automated, personal algorithmic investment platform. Wealthfront: Invest $100k+ -OR- we’ll keep crippling our product to screw you out of $$$. Now that you don’t need a large account balance to get tax loss harvesting, Betterment seems like an even more obvious choice. In related news, the fact that Wealthfront continues to taunt me with dashboard messages about how they’re intentionally passing up opportunities to save me money with their tax loss harvesting offering just became that much more infuriating. Great news. Any thoughts on how Schwab Intelligent Portfolios compares? It looks promising, but it’s similar to Wealthfront in that the tax loss harvesting is reserved only for somewhat larger accounts ($50k+ for Schwab; $100k+ for Wealthfront). It’s interesting how they’re passing it off as “no fee”. Waiving advisory fees, but corralling you into Schwab EFTs seems like an interesting trade. I assume Schwab’s EFTs have higher internal costs than the most efficient EFTs on the market or I would have heard of them before in the conversation that’s always ongoing about who can top the folks that continuously seek to undercut Vanguard on price. And if Schwab swaps your portfolio around with only their EFTs, it seems like they would have a way harder time achieving sound asset-class replacement if and when they did do tax loss harvesting for you. I have a Schwab account too. So maybe one day I’ll sit down and figure out if opting into Schwab’s proprietary EFTs via this program is a good tradeoff to avoid annual advisory fees. That jolly guy really seems excited by this.